So when I did my favourite photo tag (started by fat mum slim) the other nite I couldn't think of a fav pic of myself. I didn't have any of the pics around and being sick I couldn't be bothered leaving the warmth of the fire to go looking. So I went with one I had on the laptop and chose my Mum as I see myself reflected in her more and more each day, the older I get. This pic was taken during our post-ceremony, pre-reception 'photo-shoot'. This was one of the best parts of the day, as it was the first time we really got to take a second and chat just the two of us, talk about how the night before had been, the excitement of getting ready, how perfect the weather was for August! 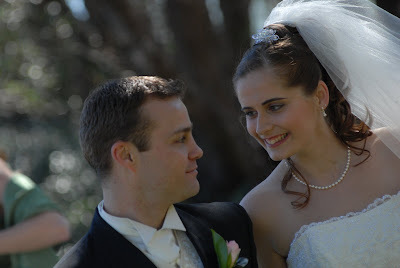 I was so unbelievably happy, I just couldn't believe that I really had found the man of my dreams and he'd married me! We only had eyes for each other and I think the photographer did a great job of capturing that. what a naturally beautiful picture. I love how you two are just so oblivious to anything else but eachother. Thanks for your kind comments guys! The photographer was fantastic! His name is David Starr and he was really laid-back and funny, he made us feel so comfortable. A lot of the time we didn't even realise he was taking pics of us, esp this one, as he was lying on the ground about 10m away, I thought taking pics of the flower girl! Most of the the candid shots I didn't even know he'd taken till I got the discs. Highly recomended and didn't cost an arm and leg for the fabulous quality!